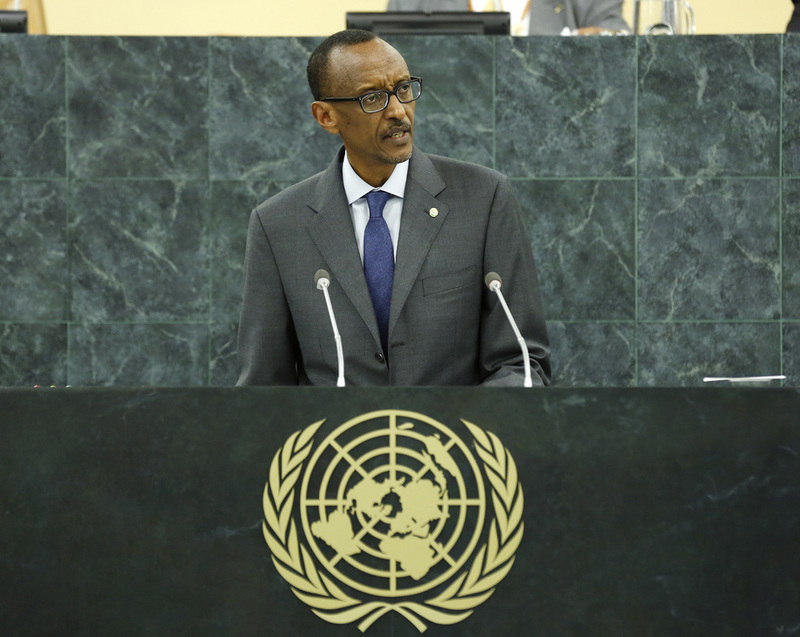 PAUL KAGAME, President of Rwanda, said that 13 years ago, the Millennium Development Goals had established humanitarian principles for the twenty-first century. Together, Member States and international organizations had stood for the idea that the poorest nations and peoples should not have to live without dignity and hope. The world was a different place now; the international community had witnessed the struggles of the global economy and was reeling from a financial crisis and a deep recession. However, it had also seen a billion people lifted out of poverty, more children in schools, greater care for the sea, and a generation born in a new age of information ready to embrace ever expanding frontiers of technology. But the transformative effect was not yet complete. The shortcomings were as long as the successes, and as the international community thought about the post-2015 agenda, it must have the courage to go beyond business as usual. The high-level panel and its report, he noted, had laid out an ambitious vision for the future, but leaders must also take an honest look at the Millennium Development Goals, to say what did and did not work, and to forge a new global partnership forged on mutual responsibility and trust. Nations must tackle greater ownership of their efforts, he said. One of the failings of aid had been the lack of attention paid to countries’ specific contexts. Now was the time for the developing world to make their vote and voices heard, to shape the debate, and to ensure that policies and programmes were demand-driven. It must also require Governments to empower those whose lives the international community was trying to transform, to give them a stake in the process and a say in their country’s future. Rwanda was working to empower local leaders while demanding accountability as an important catalyst. However, the “centre must remain stable”, and so Rwanda placed emphasis on good governance, as that inspired trust in institutions and was a foundation for development. A far greater focus was also needed on the role of the private sector and its power to create prosperity, he said. For that, a global environment without trade barriers, and greater investment in roads, railways, and airports, were needed to connect domestic markets to regional and global ones. Investments were also needed in energy and electricity. Technology played an important role, as it was levelling the economic playing field for developing countries and beginning to break the cycles of poverty. Rwanda was on a course to meet all of the Millennium Development Goals, but those were “a floor and not a ceiling”, he said. The country would remain tireless in the pursuit of progress, as it knew all too well the cost of failure. Next year would commemorate 20 years since the genocide. Over three long months, flickers of life went out all over the country. But now today Rwandans were standing strong. They had a purpose formed by a tragic past, but they were focused firmly on the future. Moving towards the next chapter of global development, the world must create strong partnerships that positively impacted the lives of all. The post-2015 era should be defined by progress, dignity and hope. Africans supported the global consensus against impunity and the creation of an international justice system to fight it, he said, adding that such a system should promote peace and security within and between nations and uphold the principles of equal sovereignty. In practice, however, the International Criminal Court had flouted those principles and shown open bias — against Africans. Instead of promoting justice and peace, it had undermined efforts at reconciliation, which humiliated Africans and their leaders, and served the political interests of the powerful. Nowhere had the Court’s shortcomings been more evident than in the ongoing trial of Kenyan leaders. The Kenyan people had shown eagerness to heal the wounds of their past, reconcile and move on. That was why they had elected their present leaders, who were under trial. They should be able to move forward, and not have their national judicial capacity undermined. The United Nations General Assembly and Security Council must uphold the principles of international justice and the dignity of Africans.